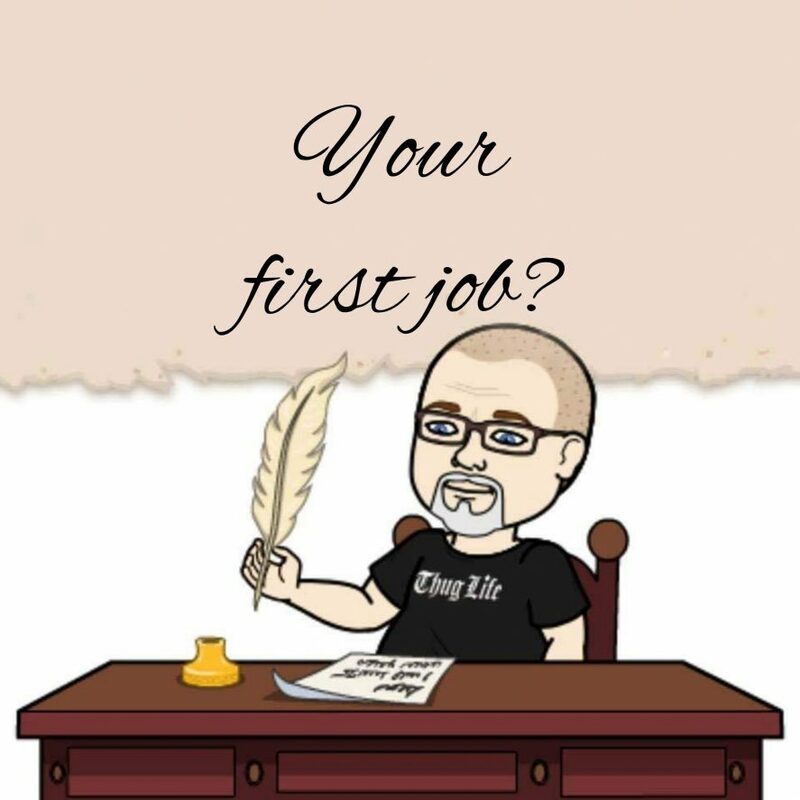 I think I’ve had several first jobs and I know that sounds weird because you can only have ONE “first” of something but three jobs come to mind when I think about this. When I was a kid, I would go and strip tobacco with my mom for cash- I would make less and I would pull “trash”- which was whatever was left on the tobacco stick so it wasn’t really hard. I doubt it was healthy because my snot would be black from the tar and I we would eat Vienna Sausages and white crackers that were brownish- again, from the tar. Most old broken down barns don’t have running water. It would be freezing and we’d have a heater and I got to keep the money I made. My second “first” job was a small engine repair shop- I worked there when I was a freshman in high school- cleaning up. My mom would drop me off after school and I would sweep up, dust, clean the machines and stuff like that. I only worked there about a month because I got expelled from high school (I’ve written about before) and the really, REALLY old guy that owned the place didn’t want it to seem like I was working instead of going to school and since I had to start night school (so I wouldn’t be behind)- I hate to quit. He wouldn’t let me work during the day because those were “school hours” and he thought it would look bad. My third “first” job and the one I look at as my REAL first job was at Danville Burger King (still my favorite job to this day.) My cousin was a manager and she got me a job there, so I worked there while I went to EKU. I worked there for a total of about 6 years or more and even moved up to being a store manager. I loved working at Burger King and was really good at it- I was fast, paid attention and but everything I had into it- so much that I was offered a change to go to the “Whopper Olympics” and YES- that is a real thing. It was literally a competition on making Whoppers based on speed and weight of the burger and even had a breakdown of the amount of each item put on the Whopper- number of pickles, onions- amount of ketchup, etc. If I could make enough money to live- I would be working at Burger King TODAY- people laugh when I joke about that but it’s not really much of a joke- I loved working there and would have made it a career- the problem is, they want you to move up into management and you have to be high up to make enough money to survive but I just liked making burgers man…and eating burgers- hence being so fat most of my life.